Some makeup trends stay around forever, and then there are some that pop every year - renamed and polished - but the same nevertheless. One such trend is the "pop of orange" or "tangerine lipsticks" or any other fancy name for a bright orange lipstick that turns up on fashion shows and trickles down to makeup every summer. I love how the color looks on all the pretty models, but somehow I have never really found an orange that works for me. 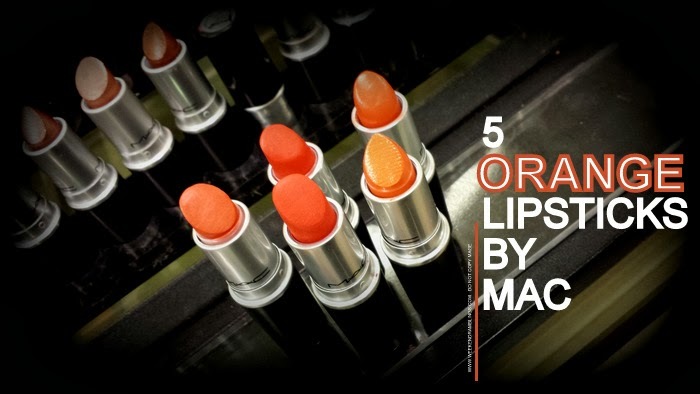 While I am still looking, here are 5 fabulous orange-ish lipsticks from MAC. Do you have a favorite orange (or orange-ish) lipstick? Do share! I don't, and it's not going to happen! My skin is kind of orange already haha. The closest I come is a pink coral, and then I'm living on the edge ;).